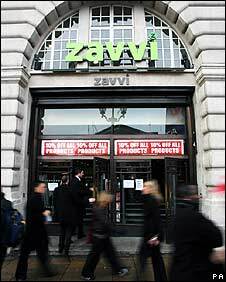 The administrators of music, games and DVD chain Zavvi have announced it is closing a further 18 stores with the loss of 353 jobs. The group's flagship store in Piccadilly in London, which employs 110 people, is one of the shops to go. The remaining 74 stores throughout the UK will remain open. The administrator is still hoping to sell the business as a going concern. The troubled chain has been badly affected by the demise of Woolworths. "Despite having received in excess of 70 expressions of interest, we have not received any offers for the store portfolio as a whole. "Consequently, with reducing stock levels, we have had to manage the cost base of the business and close a further 18 stores," said Tom Jack at administrator Ernst & Young. Last week, the administrator closed 22 Zavvi stores.